Turkish submarine TCG Preveze arrived in Albanian port Durrës for a port visit. In accordance with the cooperation plan between the Albanian Maritime Force and Turkish Navy, the submarine TCG Preveze arrived at the port of Durrës for a several day harbor visit. While in port TCG Preveze will host members of the Albanian Maritime Force, representatives of the Durres Port Authority, Military Police. This is the second time TCG Preveze visits Durrës. She was there 3 years ago. The message, sending the submarine named after an important naval victory by Ottoman Navy against the Papal fleet in the Gulf of Arta, near Preveza should be clear. This is a photo of TCG Yıldıray, during a transit through Istanbul. TCG Batıray is identical. Russian website inforeactor published a post about the Sea Breeze 2017 naval exercise, held in Ukraine, between 10. and 23. July 2017. According to the post Turkish submarine TCG Batıray was able succesful ambushing Ukrainian frigate Hetman Sahaidachny and US Navy cruiser USS Hué City. So, an incidental situation developed during the training search for a submarine in the coastal waters of Odessa. According to the plan of the exercises, the Turkish diesel-electric submarine S349 Batiray lay in ambush, waiting for the passage of a large warship. She was searched by US cruiser CG66 Hue City and the flagship of the Ukrainian fleet, the “Hetman Sagaidachny” frigate. However, already at sea it became clear that both ships were not capable of detecting submarines. On an American vessel, the towed hydroacoustic station was absent, since it was sent for repair. And in general, Americans positioned themselves as observers and advisers. On the Ukrainian ship, the situation was no better – after the “overhaul”, the GAS simply disappeared, and there were no others in the warehouses. Almost 7 hours the flotilla was looking for a Turkish submarine, until it was decided to lift the aircraft into the air. But even here the Americans did not use their equipment, leaving the search for the conscience of the Mi-14PL. On board the Ukrainian helicopter still preserved several sonar buoys, but they were without power supplies. As a result, the search was carried out purely theoretically. “Intruder” was discovered only after ascending to periscope depth…. TCG Batıray is an old submarine in service since 1978. She represents the first generation of Type 209 boats in service. Never the less, TCG Batıray being a conventional submarine and a knowing the area well has a distinct advantage against Hetman Sahaidachny and USS Hué City. The former is a Krivak III class frigate originally constructed for Soviet Border Guard forces. She is old and desperately needs replacement, something Ukraine currently can’t afford. USS Hué City is a Ticonderoga class cruiser, primary an air / ballistic missile defence ship with better underwater sensors than Ukrainian frigate. This year Sea Breeze exercise did not had a predetermined scenario. This year the exercise was held in a “free play” mode. Thus Turkish submarine took the necessary actions to hide itself and hunt its targets. The Russian is a blatant propaganda site. They published this post not to praise Turkish Navy but to ridicule the Ukrainian Navy and it’s largest supporter US Navy. But to be honest what else could be the outcome of the described encounter? That is the nature of the submarine warfare. 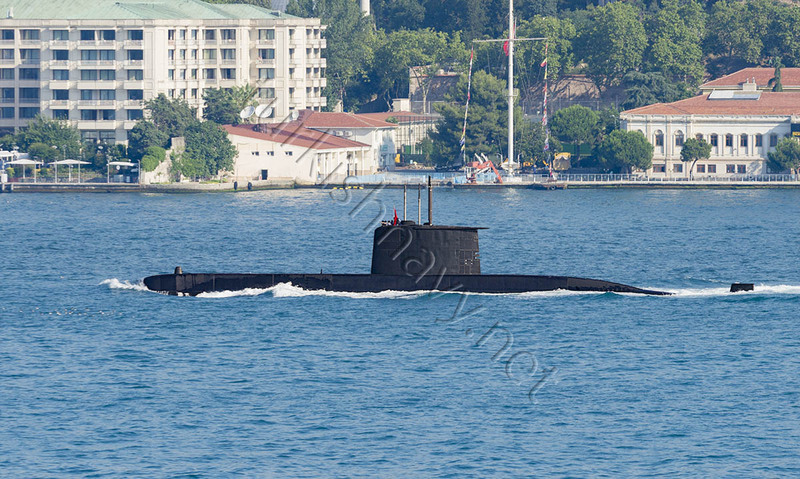 On 25 July 2017, a Turkish Navy, Preveze or Gür class submarine was sighted passing through Bosphorus. Since Turkish Navy stopped painting the pennant number of the submarines on their hulls, it is impossible to identify each individual submarine anymore. While this new painting scheme helps the submarines to blend and prevents IR/FLIR/LLTV using trackers or electro-optic directors any high contrast target, it makes ship spotting difficult. Last week TCG Preveze took part in naval exercise Breeze in Bulgaria while TCG Batıray took part in naval exercise Sea Breeze 2017 in Ukraine. Since this is the first Preveze or Gür class submarine returning from the Black Sea and the only one recently reported to be deployed in the region, I think it is safe to say that this submarine is S-353 TCG Preveze. 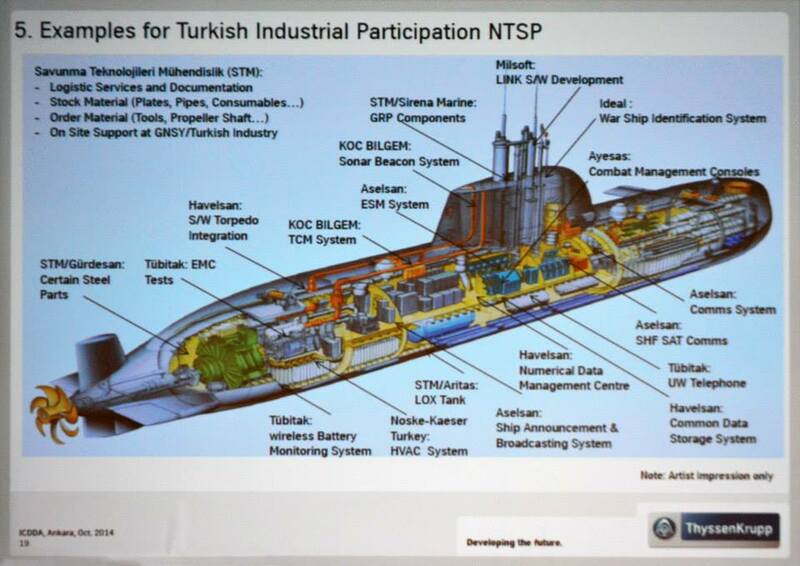 This presentation by TKMS from 2014, shows the local Turkish content in the Type 214 submarines, which is substantial compared to the previous submarine construction projects. 6 years ago Indonesia was looking for new submarines to replace her old German Type 209 class boats. Turkey and South Korea were in competition to supply the new submarines. That was odd, very odd since both nations can only construct German submarines under license but neither has a locally developed submarines design. In other words, Turkey and South Korea were offering newer German Type 209 class submarines to Indonesia, to replace her old German Type 209 class submarines. And Germany was not in the competition. In December 2011 it was announced that Daewoo Shipbuilding had been awarded a contract, to build 3 submarines. The first submarine is scheduled for delivery later in this year. Jane’s Navy International reports that in early 2017, a team from Gölcük Naval Shipyard and TKMS ,the company that created Type 209 and Type 214 submarines and visited Indonesian Navy Headquarters. In 2015, Gölcük Naval Shipyard commenced a 10 year programme, to build 6 Type 214, locally know as, Reis class submarines, for Turkish Navy. A contract with TKMS was signed in 2009. The first boat TCG Pirireis is expected to launch in 2019. According to JNI, the Indonesian Navy has received an offer from Gölcük Shipyard to supply a variant of the Reis class submarine. The meetings and presentations on the Type 214 class in Jakarta will be followed by a visit of Indonesian naval officials to Gölcük Shipyard’s facilities, where they will observe construction work on TCG Pirireis. This visit is currently scheduled to take place from 7 to 12 May 2017, in parallel to the IDEF 2017 exhibition. It will be interesting to see which side the Germans will take. South Korea could not win 6 years ago, without help and support from Germany. Both Turkey and South Korea have an ongoing Type 214 construction program both can and probably will compete again. The Indonesian submarine project will definitely interesting to watch. It is not usual for submarines to make port visit in foreign countries. TCG 1. İnönü visited the Albanian port Durrës between 30 March and 1 April 2017. Her visit to our country made in the framework of strengthening relations between the navies of the two countries and NATO operations. The submarine is about 62 m long and has a total carrying capacity of our 1456. It is equipped with eight torpedo visible, and other military equipment, the number of which has been withheld for military reasons. It is engaged in the protection of Turkish national security and in the framework of the activities of NATO forces in support of global peace and security. The submarine, the Turkish production in 2008, has a crew of 45 soldiers of various ranks. After entering the port, command of the submarine crew and officers are expected in separate meetings with the mayor of Durres Vangjush Dako and then by the Prefecture of Durres Roland Xhelili. This is a very recent and sad story and it breaks my hearth to write about it. Today Hürriyet newspaper reported about an attempted sabotage on board of Turkish submarine TCG Gür. A petty officer, whose name is withheld, was on watch at 30th December 2016 on board of submarine TCG Gür. He made several (unauthorized) trips to the machinery department and dropped pieces of metal, nuts and similar things into the main diesel engine of the submarine. The petty officer was arrested on charges “attempt to destroy the sea transport vehicle belonging to the State’s Armed Forces'” on 5th January 2017. I am happy to hear that there was no damage to the submarine and at the attempted sabotage was thwarted. TCG Gür is the first boat of the second batch Type 209/1400 class submarines. She is commissioned in 2003 and is one of the most advanced submarines in our navy. One of the four Preveze class submarines which will receive a mid-life-modernisation. The Undersecretariat for Defence Industries (UDI) has issued a request for proposal for the mid-life modernisation work on Preveze class submarines. UDI has issued the RfP in Turkish as it is local development project. 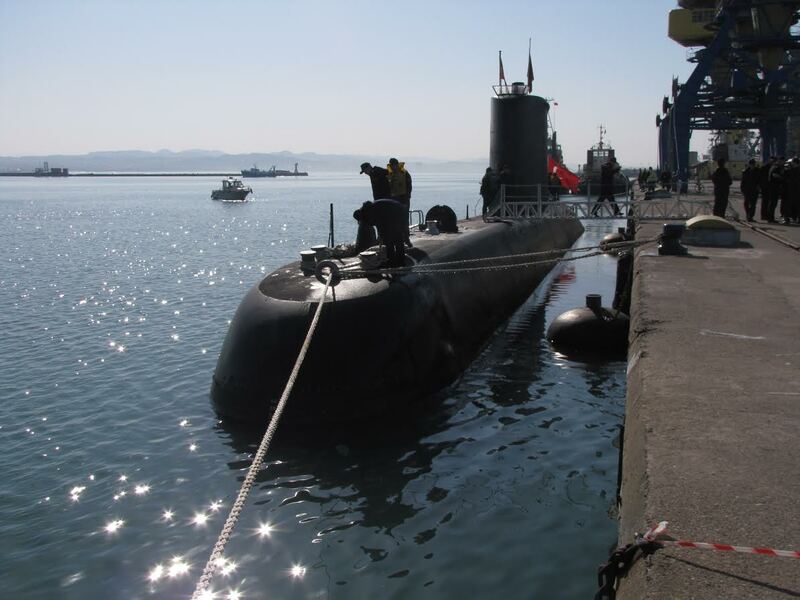 UDI previously managed the upgrade of two Type 209/1200 class submarines TCG Doğanay and TCG Dolunay. The contract was awarded to STM and the project included renewal of electronic support, attack and search periscopes and inertial navigation systems. although the scope of mid-life modernisation work on Preveze class submarines has not been published yet, it is safe to assume it will involve the upgrade of the electronic systems maybe even the combat management system. If so then the CMS developed for Preveze class submarines may work as a prototype for the future CMS of the Reis (Type 212) class submarines. 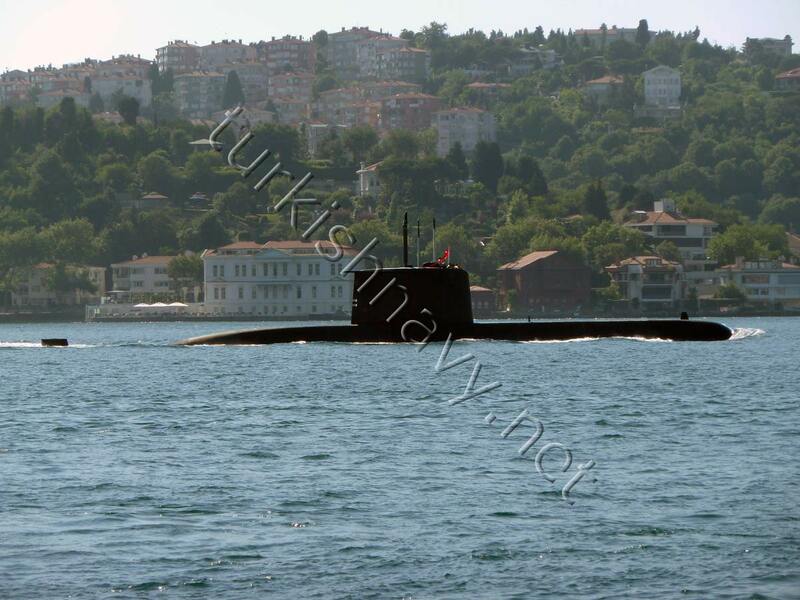 Turkish Navy operates 12 Type 209 submarines. The oldest 5 of them are Ay class submarines. The reminder are Type 209/1400 class submarines. The first batch of four is known as Preveze class and the last four as Gür class. The main difference between these are the later have a new fire control system integrated with the sonar, new data links and improved target acquisition and tracking capabilities. On 10th March 2016, a Turkish Navy, Ay class submarine was sighted passing through Bosphorus. 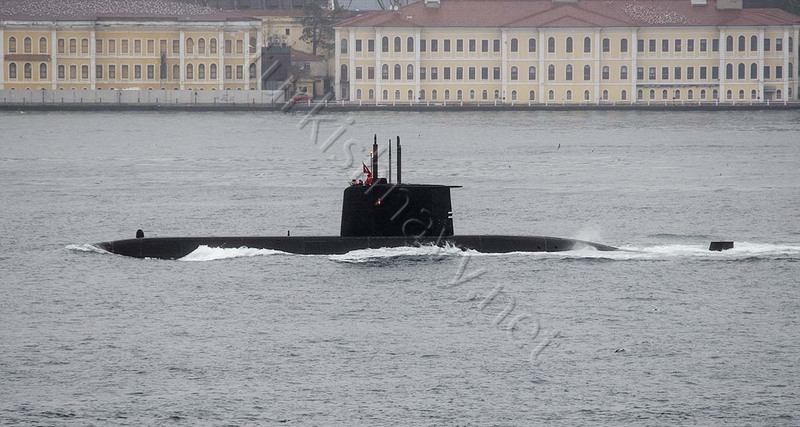 On 5th February 2016, a Turkish Navy, Gür or Preveze class submarine was sighted passing through Bosphorus. 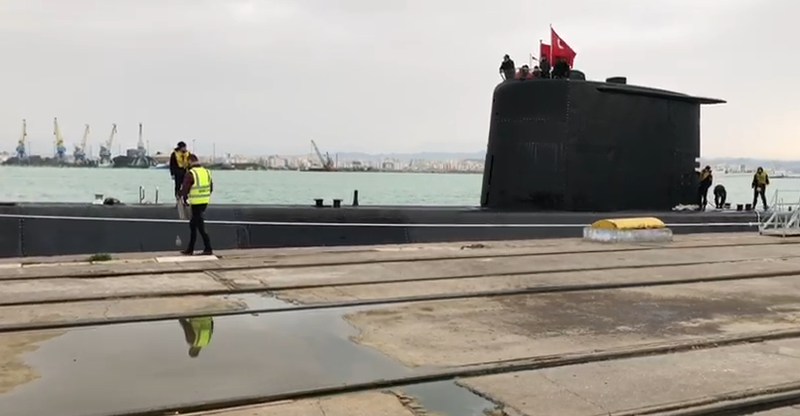 Turkish Preveze (Type 209/1400) class submarine S-353 TCG Preveze in Durrës, Albania. Photo: Albanian Armed Forces. Turkish submarine TCG Preveze made a 3 day port visit in Durrës, Albania. She was returning from the NATO exercise Dynamic Manta 2015 in Italy. The submarine set sail for this deployment on 3 September 2015. 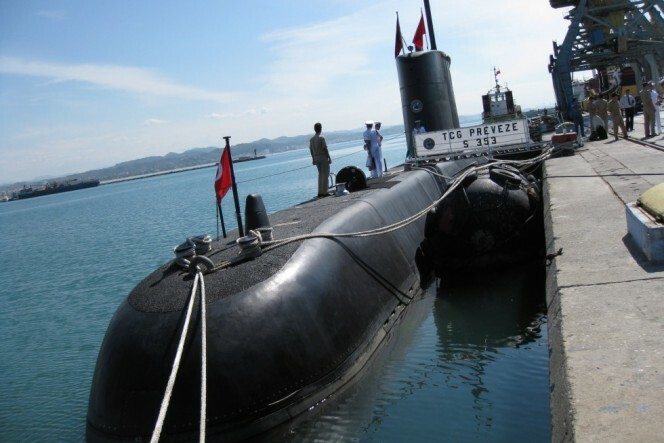 Pursuant to the Plan of Cooperation between the Albanian and the Naval Forces of Turkey, arrived for a visit in Durres port, the submarine “TCG Preveza S – 353”. The Purpose of this visit is Cooperation and joint training between Our Force and the Turkish Navy Marine. Turkish ship Was escorted to our territorial waters from small sailing motorboat R – 118, with commander kapitenllejtënant. Alket Cullhaj. In the dock 4 port Durres ND “TCG Preveza” Was Received by staff of Naval Flotilla, Representatives of the Authority and Durres Port Security, Military Police, Private Entities, etc.